Categories: Beds, Cabinet Beds Tags: Aztec, cabinet bed, cabinet beds, Murphy Bed, Sydney, wall bed, wallbed Brand: CabinetBed Inc. The Aztec Cabinet Bed has a contemporary appearance. It is available in many popular finishes. This bed is only available in twin, full, or queen size. 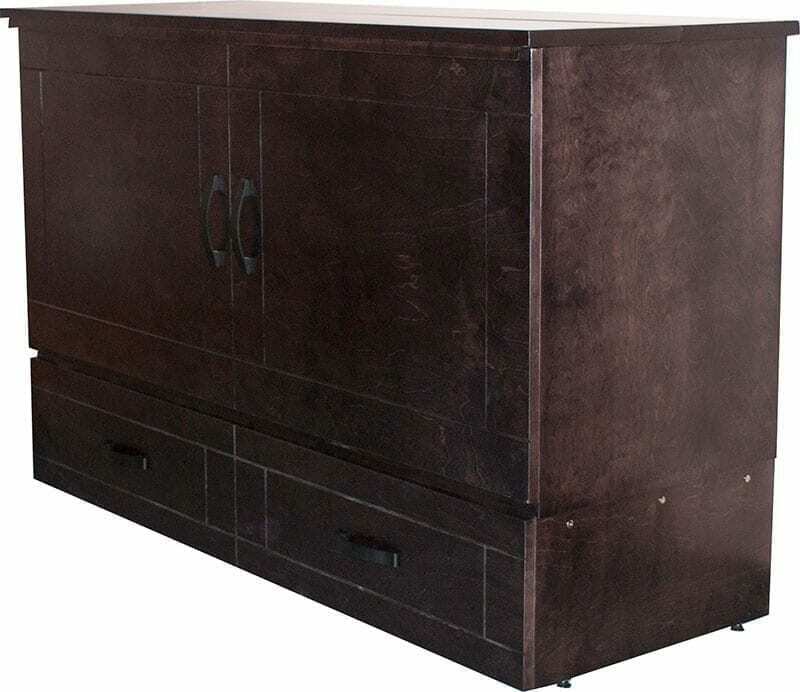 The Aztec Cabinet Bed includes a very comfortable CertiPUR-US® memory foam mattress. The mattress has a bamboo cover that is removable and machine washable. Whether you live in a studio apartment or just need an extra bed for overnight guests, the Aztec Cabinet Bed is a perfect sleep solution. When not in use, the cabinet is a great TV stand and can support flat screen TV’s up t0 80 inches. The Aztec Cabinet Bed is quality. It’s features and benefits are unlike the imports. Truly 100% made of real wood unlike any other brand on the market. This cabinet bed is simple to use. One person can open the bed in under 30 seconds. The bed features high quality hardware to easily open and close. The highest quality full extension glide system makes for easy open and close. 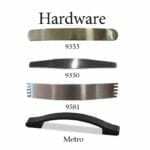 Levelers allow for easy opening and closing. Your TV does not need to move when the bed is open. Only the top portion partially lifts to fold out the bed. The Aztec storage drawer is so well built that it can support up to 500 pounds! This drawer stays attached to the bed at all times and pulls out using full extension glides. 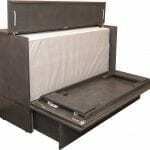 The Aztec bed comes with the memory foam mattress designed for the Cabinet Beds. The mattress cover is both removable and washable. This mattress is high quality. When you see the CertiPUR-US® seal, you can be confident that the flexible polyurethane foam inside meets CertiPUR-US® standards for content, emissions, and durability, and has been analyzed by independent, accredited testing laboratories. Our premium mattresses are certified safe by CertiPur-US. Includes a machine washable bamboo cover. The patented Cabinet Beds are made in Canada from real wood and plywood certified formaldehyde free from Oregon. 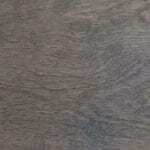 Furniture makers believe that real wood construction is strongest and most stable. We Agree! We promise to deliver a quality product that will last generations. 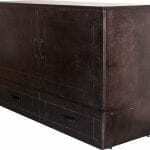 The Aztec Cabinet Bed contains no toxic and environmentally harmful MDF or particleboard. Only American Lumber is used the making of Cabinet Beds. 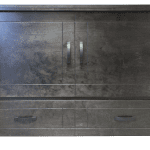 Real wood cabinet beds are also the longest lasting construction because the screws that hold up your door hinges and drawer tracks are securely anchored in the layers of the solid and plywood and won’t loosen or strip. Sue M, Medford, OR: My cabinet bed was delivered yesterday. It is beautiful in the finish, the wood quality and the design. Jay M, Green Valley, AZ: Receive the bed today. The fellow who delivered the bed was just outstanding. He was very helpful getting it off the truck and onto my dolly. It went together very easily, we are really pleased with how it looks. M Shoulson, Phoenixville, PA: I just wanted to let you know that we got the bed in time, and we love it! it looks great in the room and once our guests go home I’ll get you a couple pictures of the bed/cabinet in the space. Thanks for all of your help! S Becker: Good evening Yippee! The bed arrived, in perfect condition. We have set it up no problems. Thank-you for the speedy delivery.the driver was very nice as well. K. Holsinger: Outstanding craftsmanship, looks great, easy to convert to sleeping mode, mattress should provide a good nights sleep (have not tried yet), local delivery people were prompt and considerate, product and dealer: 5 stars. 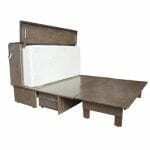 The Aztec and Park Avenue cabinet bed models look similar when the beds is stored in the cabinet in the folded position. But the beds have different hardware and fold out designs.